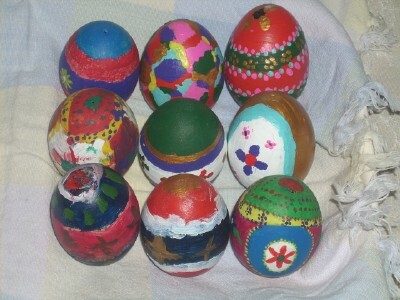 All Lent the children have been looking forward to Holy Week, our traditional time to paint Easter eggs, Monday they began painting. This year Carpenter astounded us with his creativity and artistic passion. The children paint over a number of days in layers of acrylics. 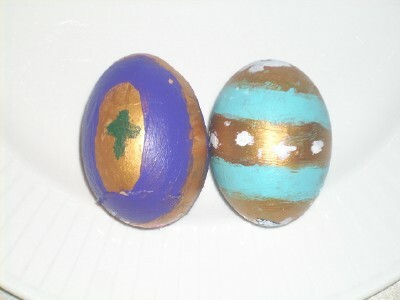 Theses two eggs were painted by Princess. 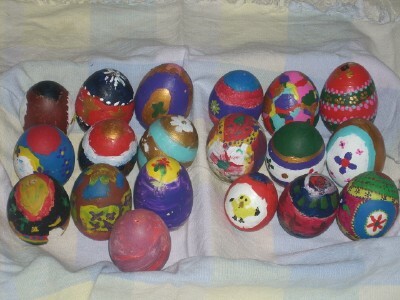 My friend Jenn has created a longing to decorate in pysanky style, but we have yet to find any kits in Australia. First the eggs are pierced at either end with a needles, then the yolk and white are blown out. I recently heard of boiling the shells to totally clean, but we haven’t to date. 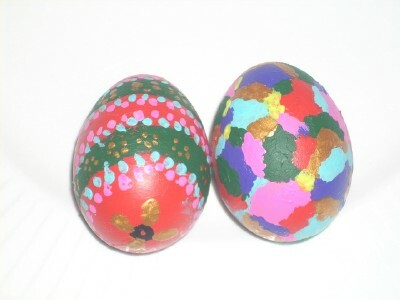 The two eggs at the back were decorated by Michelangelo, the egg on the right was painted by Koala a couple of years ago. Our eggs have become treasured family heirlooms, gracing our table for Easter and carefully stored away each year. Einstein experimented with a different style this year, the stone washed pink at the left front. Our collection from this year and years past. They are gorgeous!!!!! I love them! Make sure you tell them. 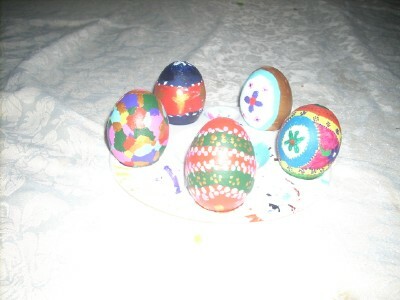 I just love decorated eggs! I would have never thought of Acrylic paint! I started with permanent markers (Do you have Sharpie brand there? )…but painting with a brush? Your childre are more talented than I! These are beautiful!! What a great tradition.